Human Rights Watch executive director Sarah Leah Whitson tweeted this, claiming that Israel never allows universal human rights reviews and is a "rogue state." In her opening remarks, Aviva Raz Shechter, Israeli ambassador to the UN in Geneva, laid out bluntly how Israel was going to receive the recommendations of fellow members. "The continuous discrimination against Israel in the HRC and the unparalleled number of one-sided biased and political resolutions adopted regularly by the automatic majority of its members testify not only to the unfair treatment of Israel but also to the deficiencies of the council itself and its agenda," she said. Shechter said Israel would submit to the review process despite what she called the HRC's bias, and demanded its overhaul. Shechter, the Israeli ambassador, said it was deplorable that UN representatives would use the UPR session as what she called a platform to politicise the human rights discourse. "It is a cynical and hypocritical attitude meant to distort the reality," she said, adding however that Israel would continue to cooperate with the HRC and take "seriously" the recommendations made at Tuesday's session. There is no rule that says a country has to attend the meeting where the report is being released. 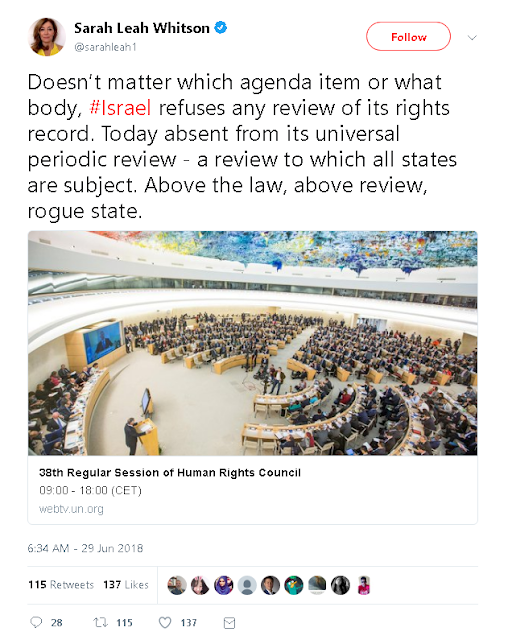 HRW is falsely pretending that boycotting the meeting shows that Israel is a "rogue state" that refuses "any" review - this is obviously a lie. Israel is boycotting the entire week's sessions, not just the meeting that released its hugely biased review, because of its clear and obvious bias. The January session buttressed the point of how the UNHRC is anti-Israel not only in its specifically anti-Israel Agenda item 7 but altogether. The only other country I could find that HRW has ever referred to in an unqualified fashion as a "rogue state" was Burma in 2008. Which shows that HRW is fully on board with the anti-Israel bias of the UNHRC.